Our big Small Press Expo weekend kicks off on Friday, Sept. 14. Dan Clowes and Alvin Buenaventura will be signing copies of their new book Modern Cartoonist: The Art of Daniel Clowes at the store from 5-7PM. Then our annual SPXplosion pre-party kicks off at 7PM. Our friends at Golden West Cafe are catering the party, and adult beverages will be served. Then, on Saturday and Sunday, we'll be set up in Bethesda at the Small Press Expo. Our table will have Ben Claassen, Luster Kaboom and Dina Kelberman. And of course, Atomic Books will be open regular hours all weekend long. We know that not everyone can attend our signing with The Hernandez Brothers on Tuesday, September 18, but we still want to make sure people have an opportunity to get their favorite books signed. Pre-order signed copies of Love and Rockets books now. Orders must be received by September 17. Books will ship after signing on September 18. In case you've been too busy going back to school or work to hear about what's going on around these parts this weekend, we thought we'd take a moment to give you the rundown - it's something you're not going to want to miss. Today is First Fridays in Hampden - and a number of area businesses have special events, sales, refreshments, etc. It's also Celebrated Summer Records 6th Anniversary. The celebration starts with a massive $1 7-inch sale/happy hour. About ten boxes of singles will be marked down to one dollar! The Good, the Bad, and The Ugly are mixed through with some hidden gems as well! Also – shirts, 5 dollar CD’s, donuts and root beer! Whatever survives the 7th will be out front for folks to dig through during Hampdenfest! 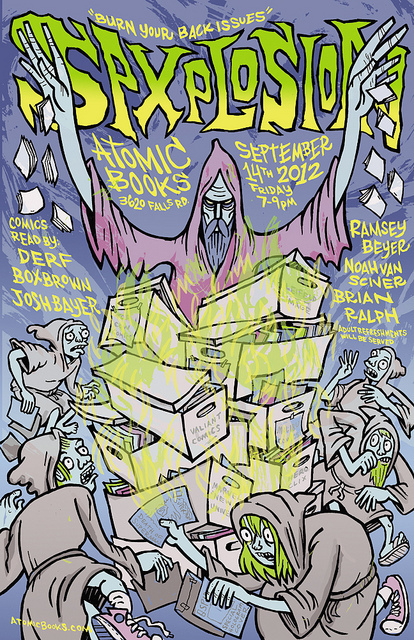 Atomic Books will also be serving adult beverages. 6-8pm! !